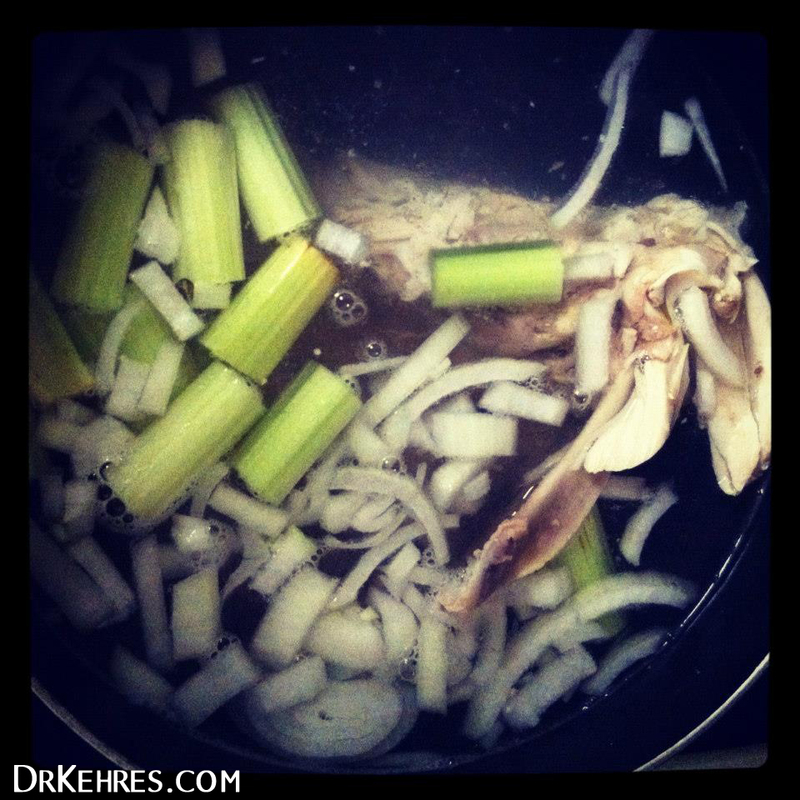 Bone broth is one of the healthiest things for digestion and very easy things to make. Take leftover bones and carcass and put them into a large pot. 10-12 cups water or until everything is submerged. Bring the pot to a boil and then reduce to a simmer. Leave it for 3-4 hours. Drain everything besides the liquid out. It's great for soup or just to drink! This is a paleo recipe, gluten-free and dairy-free. Happy Thanksgiving from Kehres Health! I'm grateful for all the people in my life. 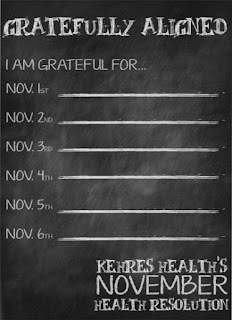 My wife, my family, my in-laws, my clients, all the people who come to our classes, read our newsletter, and all the people who comment on the Kehres Health Facebook page! 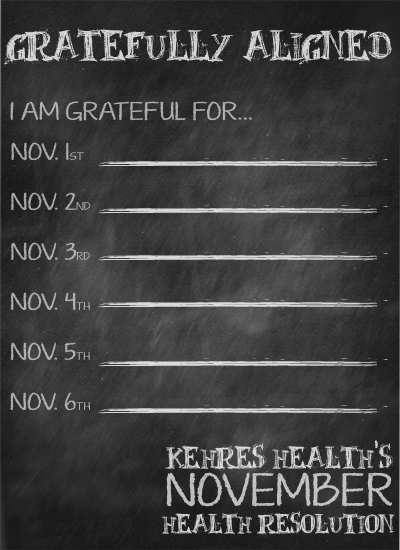 Join Kehres Health in writing down one thing you are grateful for every day this month. 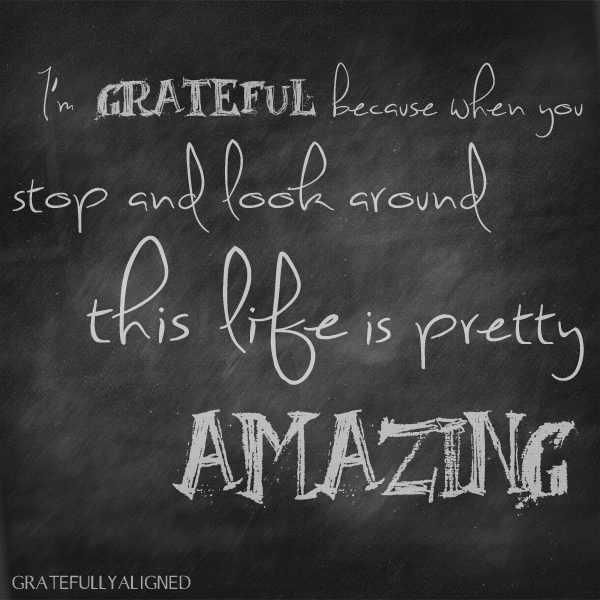 Be gratefully aligned! I created a Facebook album, you can make your own album, write down a list or tag posts on Instagram or Twitter with #gratefullyaligned. 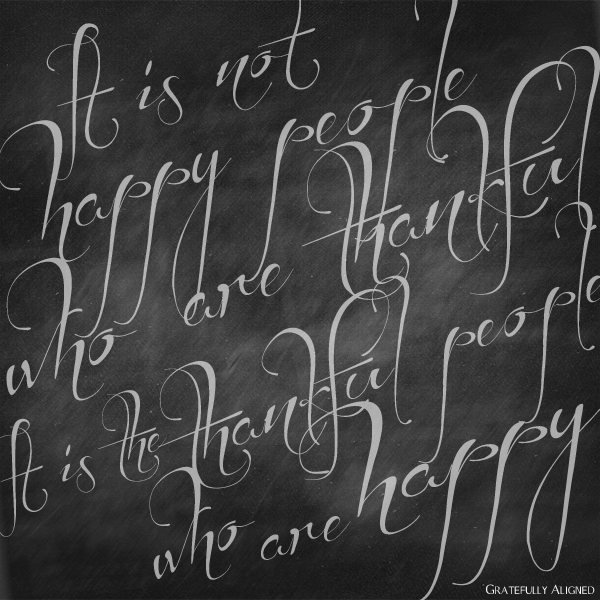 November health resolution: Gratefully Aligned, write down one thing you are grateful for every day. Researchers found that people who have a positive attitude during stressful events are 22% less likely to have a heart attack than those who have negative attitudes. It can be difficult to improve your mood or change from a pessimist to an optimist overnight, but it is something you can practice. For example, if you want to run a marathon, you train consistently by running a little bit every day. You don't become a marathon runner overnight. You can also train to improve your mental health, which is this month's resolution. Practice optimism by focusing on the positive instead of dwelling on the things that are going wrong in life; writing down what you are grateful for every day is one way to do this. Keep a list on your fridge for you and your family to write what you are grateful for, write in a journal by your bed, post it on Facebook or Twitter or make a list on a chalkboard. Improve your health by focusing on the good in your life every day to keep you gratefully aligned. We have bracelets imprinted with Gratefully Aligned available at Kehres Health, stop by and pick one up!